I review Air New Zealand economy and the Skycouch! 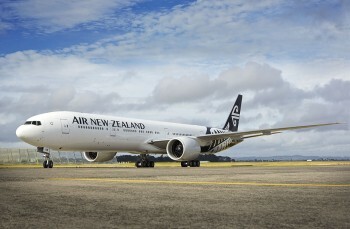 As part of our Air New Zealand competition, which launches today, I will be taking a look at the unique features of the ANZ in-flight product. This is what you will experience if you choose to fly them from London to Los Angeles and, optionally, on to Auckland. In the current Air New Zealand sale, which ends on 23rd September, prices start at £449 for Economy, £870 for Premium Economy and £2,327 for Business Premier. In this article, I want to focus on their Economy service and the Economy Skycouch. This is, after all, the prize that one Head for Points reader will be winning. 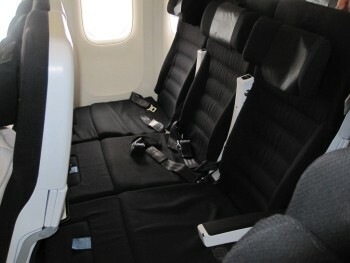 Articles on Business Premier and Premium Economy will follow over the next couple of weeks. It wasn’t practical for me to fly to Los Angeles and check out their seats and service for myself. Air New Zealand did arrange the next best thing, however. I was given a private tour of their new Boeing 777-300 aircraft whilst it was on the ground at Heathrow. The 777-300 has 244 economy seats in a 3-4-3 formation. seatguru.com gives a seat width of 17.1 inches and a pitch of 32-33 inches. The width is slightly narrow than a British Airways 777-300 which is nine across, but this is partially offset by additional legroom. On-screen snack ordering. I was impressed by this – if you are feeling peckish between meals, you can order a variety of snacks via your TV and the crew will deliver them to your seat. 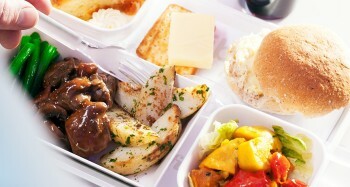 I’d be happy to see this in Business or First Class, to be honest, so to find it in Economy was pleasantly surprising. The Air New Zealand economy seat is profiled on their website here. The key differentiator with other airlines, however, is the patented Economy Skycouch. 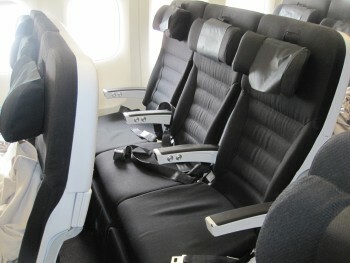 The Skycouch is installed on rows 37 to 46, which is the ‘front’ economy cabin immediately behind Premium Economy. This means that there are 20 Skycouches in total, 10 of each side of the aircraft in the block of three seats by the window. The Skycouch allows a 3-seat block of economy seats to be converted into a flat surface measuring 74cm x 155cm. There are a number of ways in which you can use the Skycouch, and any combination will be available for the winner of our competition. A couple can reserve a Skycouch for an additional £299 per couple. This guarantees an empty middle seat as well as the ability to turn the seats into a couch. A solo traveller can reserve a Skycouch from £599. This guarantees the traveller two empty adjacent seats and the ability to turn the seats into a couch. These prices are each way, based on travel from Heathrow to Los Angeles. You can find out more about the Economy Skycouch on the Air New Zealand website here. As a member of Star Alliance, you will also collect miles and status points with any Star Alliance loyalty programme when you fly Air New Zealand. If this sounds interesting, you can win your own Skycouch flight to Los Angeles in our competition which launches today. I’m dissappointed by the pricing. **From** £600 each way…for only half the leg of the trip (LHR-LAX)… It’s better to fly Business, for me at least. I don’t think headforpoints is the best place to promote this given the audience of this site – which is more Business class and up driven or at least status earning to nab the best seat in Economy. Just my opinion. These are the best seats in Economy! You need to remember that LA is a very tricky route to get Avios seats, especially for a family of 3 since you are above the ‘guaranteed minimum’ of 2 Club World seats. In contrast, there are no black out dates for this prize subject to seats still being available. Even if you a dedicated ‘business only’ person, I think most solo travellers would swallow their pride and take the Skycouch for solo occupancy if it meant saving 150,000 Avios + £550 tax! I agree with your general point though. I would not give away a standard economy flight on the site or, indeed, a hotel room below a four star. There are some reports that Ryanair might become able to join Avios (honest! it’s to do with the Aer Lingus slots @ Gatwick http://www.belfasttelegraph.co.uk/business/news/ryanair-passengers-could-get-ba-flyer-miles-in-takeover-bid-quirk-31396969.html ). I’m not proud: I’ll happily fly economy if I need to go somewhere and there are no reward flights available or crazy low fares in biz so this article is actually really interesting. Almost all of my redemption/cheap business flights have been to places I was not that bothered about going, but went there because of the flights. So, I’m very interested to see improvements in Economy cabins because that is where I will be spending quite a bit of my time once the novelty of on-board champagne wears off and I start booking my holidays based on location rather than seat number . I don’t seriously expect to be able to maintain my position at the front of the ‘plane indefinitely (my employer has a travel ban so every tier point and avios is hard-earned), so any improvements to economy travel are good news for me, and I want to read about it! I think this shows real innovation in the industry, good luck to them! Sure it might not float everyone’s boat but as a couple if you can get the extra space for an extra £300 that’s good VFM in my book! Let’s face it: it’s just 3 seats where there’s a flipover seat to make it wider & the armrests don’t get in the way. About the best thing the Kiwis have invented, maybe. Doesn’t really compare to all the stuff we invented but they’re only 4 million. It looks to me as if access to the life jacket would be severely restricted, but surely that cannot be the case? Flight safety rigmarole really ps me off. The trolley dollies even get a bit annoyed if you don’t pay attention. Let’s face it: the only time a safety belt will help you in an emergency is an extremely rare time, most other times you’ll be dead. The only time a life jacket will help you in an emergency is an extremely rare time, most other times you’ll be dead. Once I had a bit of a problem because I like to do up my ‘safety belt’ at its biggest/ longest limit – more comfortable. A trolley dolly saw it & started to moan at me to tighten it up. In my younger days I might have argued, but I am an old frat now so just tightened it a bit until she went away then loosened it again & hid it under my magazine. I think the idea of safety belts is to keep you attached to your seat – so that you don’t get ejected and your flying personage does not impact someone else. It’s not really for your own good you know. Oh, and to keep you safely in your seat in case the plane suddenly drops a few hundred feet in turbulence – in that case it would stop the ceiling hitting your head as it drops through sudden no-air air. oh I had the belt done up – just loose! I’d have thought that even a loose belt will stop you hitting your head on the ceiling? Most times it will, sometimes it won’t. Though I hardly think expecting them to analyse everyone’s belt length to body size ratio to establish whether you’ll remain in your seat is a reasonable use of their time! It’s not as if they’re telling you to make it excessively tight – you can still have it loose enough to not feel it. You’ve clearly never heard of clear air turbulence then! The skycouch certainly looks innovative, but if it wasn’t the prize being offered, would it have featured on your site (can you book it with miles)? I think this is also the first time I’ve read a seat review that was done (in an empty plane) entirely on the ground. But the point I feel needs more emphasis is the seats being “slightly narrower” than BA’s (or anyone’s) 9-across economy on this aircraft type. The physical difference may be slight, but the difference in comfort is significant… esp on Air NZ’s “very long sector lengths” (I’m speaking from experience, unfortunately… something I wouldn’t do again, though the service and IFE were quite decent). Anyway thanks again for running the comp… I do understand if such articles are required to run them, and have entered regardless of my reservations!